1. How fast does it really fly? Well, it exceeds Mach 3 or three times the speed of sound . Mach 1 is 330 m/s or 741.4 mph, the speed of sound. Mach 2 is twice this; Mach 3 is three times this. It out-flies the sun. You can have breakfast in New York; fly to Los Angeles (in a Blackbird), have another breakfast (time wise) before you left New York. The SR-71's fly at 33 miles per minute or 3,000 feet per second. It flies faster than a 30-06 bullet. 2. Isn't the X-15 the fastest airplane, not the SR-71? The X-15 is the fastest airplane and was rocket powered. The SR-71 is the Fastest air-breathing jet in the world. 3. How high does it fly? 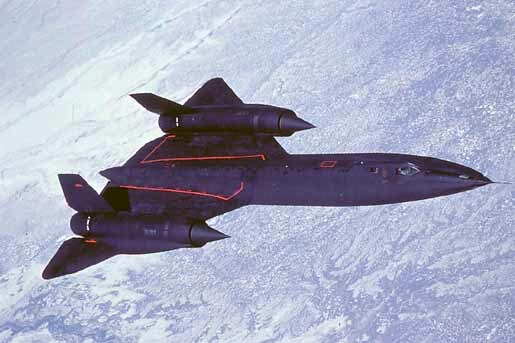 The SR-71 flies in excess of 85,000 feet (16 miles up). The curvature of the Earth has been said to be visible. 4. What was the purpose of the aircraft? It is an unarmed global strategic reconnaissance spy plane. 5. How much did it cost to build? At the time, each SR-71 cost 33 million to build and after becoming accepted by the U.S. Air Force the price tag went to 34 million per airframe. 6. What materials was it constructed with? Actually, it was the first true Stealth aircraft. It is composed of Titanium and Composite (plastic) materials. The landing gear is the largest piece of titanium ever forged in the world. The United States did not have enough Titanium to build the fleet and ironically, we bought the needed Titanium from Russia. 7. How hot does the aircraft get flying at Mach 3+? From 600 to 900+ degrees Fahrenheit on the airframe. Temperatures on the J-58 engine exhaust reach 3200 degrees. 8. How many SR-71's were built? 50 Blackbird airframes of various designations. The dies or molds were destroyed as directed by then Secretary of Defense McNamara to prevent any other nation from building the aircraft. 9. How good are the cameras on the aircraft? They can photograph a golf ball on the green from 80,000 feet. The cameras can survey 110,000 square miles of the Earth's surface per hour. 10. Why is the aircraft painted black? It actually flies 75 degrees Fahrenheit cooler than an unpainted airframe and also the black paint has some radar absorbing qualities. 11. How many aircraft were shot down by unfriendly forces? None. In 1981 Kelly Johnson announced that the SR-71 has had over 1,000 missiles launches against it, but none successful. 12. If I was the pilot of an SR-71 would I lose weight after the mission? Yes, Pilots in a pressure suit can lose up to 5 pounds in a four hour flight. 13. I have heard that the nickname of the SR-71 is "HABU", what does that mean? Habu is the name of a Cobra snake in Okinawa, Japan. Because of the sleek "hooded" appearance of the Blackbird, the Okinawan's claimed it looked like a Habu snake. Thus the nickname. Additionally, SR-71 Crewmembers are called Habu's. 14. Was the SR-71 designed by a computer? No, every aspect of the aircraft was designed with a Slide Rule! 15. Where are all of the SR-71's now? One Blackbird is at the Smithsonian in Washington D.C. which is our record setter, tail #61-17972. The display at Dulles Field is due to open in December 2003. A Blackbird is on display at "The Museum of Flight", Boeing Field near Seattle-Tacoma Airport. This one is actually an A-12 (early version of the SR-71) with a D-21 drone installed between the vertical stabilizers ( photo at right). The D-21 was designed to be launched from the A-12, flying unmanned over unfriendly territory (accurate designation was the M-21 when mated with the D-21 drone). Kelly Johnson cancelled the program when a D-21 was launched into the area behind the cockpit of the M-21 resulting in loss of the Launch Control Officer's life and loss of the aircraft. The "Museum of Flight" A-12/Drone display is the only combo in existence. Some SR-71's have crashed and others are located on display at military bases or museums in the United States. Go here to locate a Blackbird in a museum near you. 16. Why did the U.S. Air Force quit flying them? Costs to operate was a minimal factor in the actual decision to cancel the SR-71's. There was a variety of reason, but in the end it boiled down to politics in the Pentagon. 9th SRW Commander Colonel Richard Graham's book "SR-71's Revealed" details the reasons for cancellation of the SR-71 Program. There are no Blackbirds designated for flights. The remaining Blackbirds are all currently in Museums or are awaiting disposition to a Museum. 17. Has any woman or enlisted man flown on the SR-71? Yes, Congress-lady Beverly Byron, who took a ride in the B model in November of 1985. Additionally, in October 1991 Marta Bohn-Mayer became the first Female Pilot on the SR-71 at Dryden Flight Research Center. No enlisted man ever flew on the Blackbird to my knowledge. Those fortunate enough to ride in the 2 seated trainer model received a Mach 3 pin and patch stating "I flew three times the speed of sound". 18. How many people have flown the Blackbirds and how many crewmembers have been killed? 478 total people have flown the Blackbirds. More people have climbed to the top of Mount Everest than has flown this aircraft. 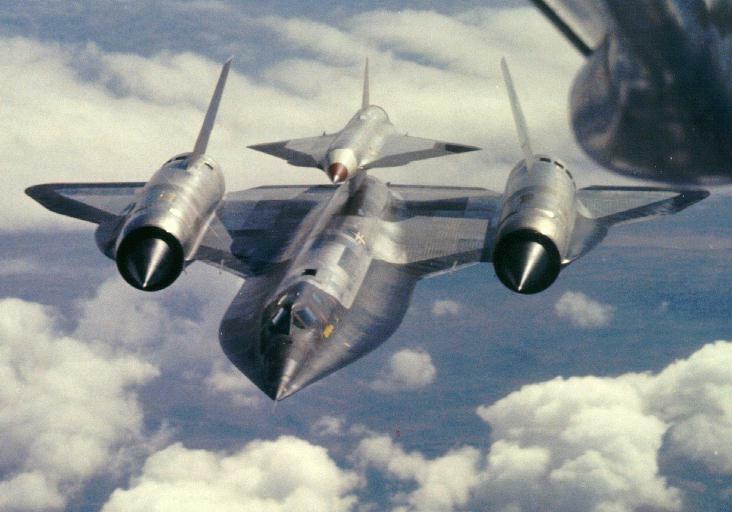 Although a few Lockheed crewmembers were killed during the testing stages of the Blackbird, the U.S. Air Force never lost a man in the entire 25 years of active service. The SR-71 flew for 17 straight years (1972-1989) without a loss of plane or crew. Considering the environment the Blackbirds flew in, that is an enviable safety record. 19. I have worked on the SR-71 and would like to get in touch with others that I worked with. How do I do it? If you have worked directly with the SR-71 or U-2, you may qualify to join the Blackbird Association. Pilots, Support personnel, Contractors and PSD support are examples..
2.The Blackbird Association is Not a Locator Service!. Questions directed in this area will be ignored. If you wish to try and locate a former member you may go to the following link: "Alma-Mater and Recollections of the Past" and perhaps you may find the individual. Your Complete Home Mailing Address. Please insure the address is correct in all aspects. Sending just your E-Mail address is not sufficient. Please note that this web site has nothing to do with your application to the Blackbird Association. The above links are provided as a courtesy service to the Blackbird Community.